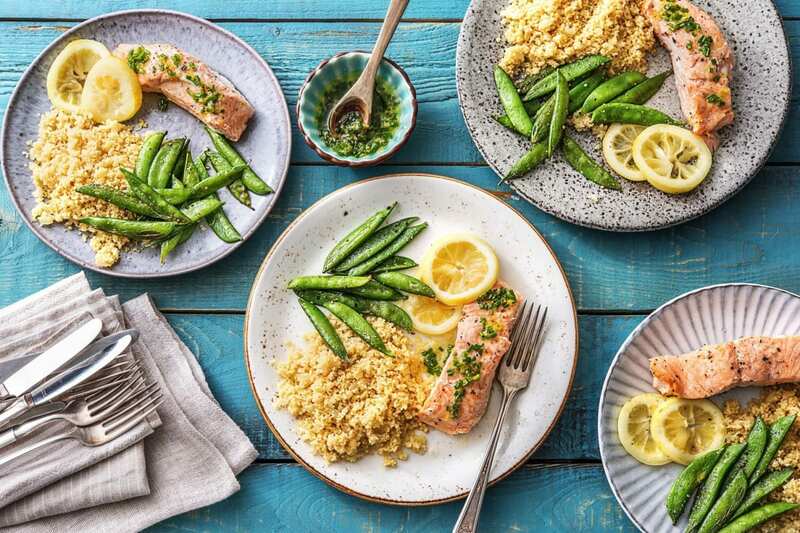 Perfect little packets of tender and lemon scented salmon alongside fluffy couscous and crisp sugar snap peas will have you amazed at what you can create in 20 minutes! Preheat your oven to 325°F (to bake the fish and roast the snap peas). Start prepping when your oven comes up to temperature! In step 2, the packets will be hot when done. Set them aside for 5 min to cool slightly! Wash and dry all produce. * Zest the lemon, then cut the lemon into 1/4-inch rounds. Finely chop the chives. Cut two 12 X 8 rectangles of foil (4 squares for 4ppl). Pat the salmon dry with paper towels, then season both sides with salt and pepper. Meanwhile, heat a medium pot over medium heat. When the pot is hot add 1 tbsp oil , then the onions. Cook, stirring occasionally, until softened, 3-4 min. Add the broth concentrate(s) and 2/3 cups water (dbl for 4ppl). Bring to a boil over high heat. Once boiling, remove the pot from the heat and stir in the couscous. Cover and let stand for 5 min. Meanwhile, on another baking sheet, toss the sugar snap peas with 1 tbsp oil. Season with salt and pepper. Roast in the centre of the oven until tender, 3-5 min. Meanwhile, in a small bowl, combine half the lemon zest, 1 tbsp chives (dbl for 4ppl) and 1 tbsp oil (dbl for 4ppl). Season with salt and pepper. When the couscous is done, fluff with a fork and stir in the remaining chives and remaining lemon zest. Season with salt and pepper. Divide the salmon, couscous and snap peas between plates. Drizzle over the lemon-chive sauce.